Everywhere we’ve gone so far, there have been very few foreign tourists like us. Most of the tourists — and in some places all of the tourists — are Chinese. Sometimes they’re in pairs or families, sometimes in groups. When they’re in a group, even if it’s just 5 or 6 people, they hire a tour guide. I used to be a tour guide when I lived in San Francisco, so I know the routine, and I know a good tour guide from a bad one. These are almost all bad ones. I may not speak any Chinese apart from the words for ‘thank you’ and ‘hello’, but I can tell when someone is reeling off a memorized speech in a monotone, and that’s what these tour guides do. It’s not just the sound of their voices; it’s the fact that their eyes don’t make contact with their clients’ eyes. Instead their gaze is fixed above the tourists’ heads somewhere. Anyway, that’s no problem for me, of course. Except that these tour guides often carry around a portable loudspeaker in a backpack, and speak into a microphone, so all of us get to hear their memorized litany of facts and figures. The quality of the sound varies enormously, so sometimes the voice is amplified through hissing static. At Longmen Grottos, as at other popular sites, there are numerous groups with tour guides. If one has arrived at a particular grotto and started talking, and then another one arrives too, they don’t just stop and wait their turn. No, they start talking as well. So then all of us are treated to the sound of two competing amplified monotones. And because they’re competing, they both talk louder. And don’t imagine that stops when a third group arrives. It doesn’t. Then all three talk simultaneously and loudly through their sound systems. And, of course, all of those tourists are trying to get a glimpse into the grotto at the same time. 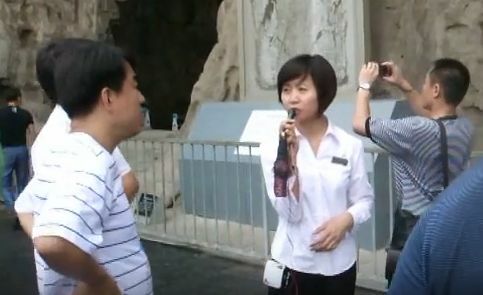 I don’t know how they manage to follow what their tour guide says when they can understand all three voices. It finally occurred to me to record this yesterday. On this 30 second film you can get an idea of how it sounds when three tour guides are talking over each other. Imagine this much more packed with people and you’ll know what the Forbidden City was like. The other remarkable thing that Chinese tourists do is pose in front of things: the grottos themselves, but also monuments, views, whatever. And when they pose, they often hold one hand up in a victory sign. I saw one pair of young women yesterday who I swear posed that way in front of every single grotto, first one woman, then the other. I’m sure I’m being culturally insensitive here, but that’s got to be the dullest photo album ever! Haha. I found your post so funny and interesting. It’s always intriguing to hear other people’s opinions and views!